Cordless tools may be king on the jobsite, but that doesn't mean there isn't a place for corded tools in your life. Corded tools offer a few key benefits over their cordless cousins, such as more speed in a lighter body at a much lower cost. Plus, as long at you pay your electric bill, you will never run out of power. 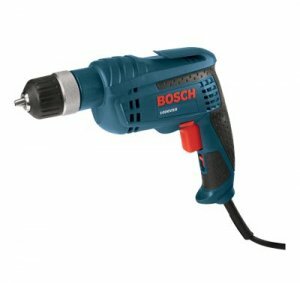 Bosch's latest corded drill model 1006VSR uses a 6.3 amp motor to deliver 0-2600 RPMs, which is significantly higher then an 18 volt equivalent, while also keeping the weight at only 3.4 lbs. It also features a 2 finger variable speed trigger and a newly designed soft grip handle which is said to offer users added comfort throughout the day. The 3/8" drill uses a keyless chuck to make changing bits a quick and easy task, and a belt clip frees up your hands when you need them. The new 1006VSR will be available later this fall for around $60.